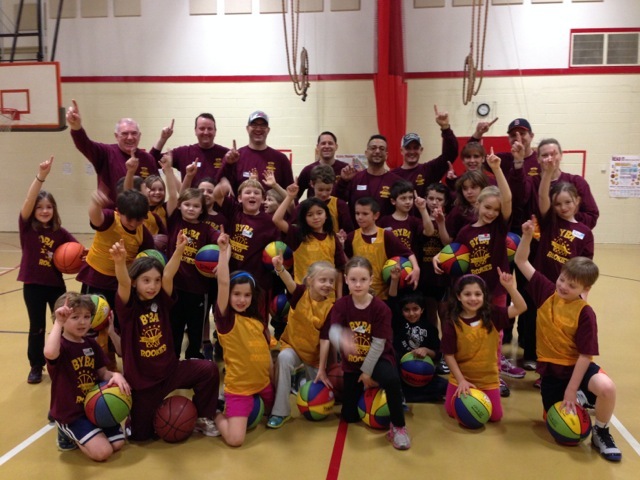 After spending the winter Saturdays learning how to dribble, pass and shoot, ninety second graders in the BYBA Rookies Program will conclude its second season with a morning of individual and team skills challenges and mini games of four on four. Included in the skills contests will be a penny Egg Crate Relay, Hot Spot Contest and a Skills Obstacle Course. Each week of the season, these second graders received expert instruction in the basic skills of basketball. The emphasis was on learning “how to play basketball,” rather than “running plays” and “winning games.” Team play was stressed throughout the sessions. Each session began with a discussion of the quote of the week, followed by ball handling practice, then listening to a mini lecture on a particular skill and finally a short practice session on that skill. In addition, the Rookies play controlled half court games of three on three and full court games of four on four with the coaches assisting as outlets and passers. Todd Green, Jason Tournet and Paul Lyons organized and provided the expert instruction for each session. In addition, many parents volunteered to serve as assistant coaches and provided additional individual and team instruction. On Saturday, a brief presentation will be held at the end of each of the three sessions. Each player will be awarded a medal for his or her enthusiastic participation. In addition, the winners of the individual and team challenges will receive medals. The sessions will end with the players being reminded of the Rookies motto to always “Shoot for the Stars” in basketball and in life.